Success in the Sweet Sixteen games: #1 seeds, #2 seeds and… #8 seeds? Sports Stats ‘on Tapp’ is a sports statistics blog that is published multiple times weekly focusing on stats that go beyond the numbers. Four regional semi-final games will be played on Thursday and four on Friday. How well have each of the seeds performed in these Sweet Sixteen games? 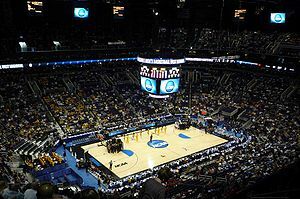 Since 1985, when the NCAA went to a 64-team tournament, number one seeds have won over 80% of their regional semi-final games; number two seeds have won over 70% of their Sweet Sixteen games, and #8 seeds have a 7-3 record (a .700 winning percentage) in regional semi-final games. These are the only three seeds that have a winning record in regional semi-final games. Following are each seeds and their win-loss record in the regional semi-final games since 1985. Here’s a few notes about the seeds in regional semi-final games: #1 seeds are only 3-3 in the last two tournaments… at least one #2 seed has lost in the regional semi-final in each of the past four years… at least one #3 seed has won a regional semi-final game in nine straight tourneys… #4 seeds are only 4-15 this century… #5 seeds are 3-0 in the last two tournaments… a #7 seed has not won a regional semi-final game since 2005… the last time a #8 seed lost a Sweet Sixteen game was in 2002… the last time a #9 seed won a Sweet Sixteen game was in 1994… a #12 seed has lost a regional semi-final game in four straight years. The first week of the NCAA men’s Div. I basketball tournament is in the books and we have our Sweet Sixteen contingent. All four number 1 seeds advanced, as did a pair of #2 seeds, a pair of #3 seeds and three #4 seeds. Back in 1985, the NCAA went to a 64-team field for this tournament. Since that year, 61.6% of the teams making it to the Sweet Sixteen were teams that started the tourney as a #1, #2, #3 or #4 seed. Another way of looking at this stat is that in the past 28 years of the tournament, 172 teams that were a #5 seed or lower made it to the Sweet Sixteen, an average of just over six teams per tournament (this year there are five teams seeded lower than a #4 seed still in the tourney). Here’s a quick look at how many of each seed made it to the round of 16 in the tournament since 1985. Here’s a few interesting notes about the seeds of the Sweet Sixteen teams from 1985 through 2012. * #1 seeds: At least three of the number 1 seeds have made it to the round of 16 every year since 2005. At least three #1 seeds have made the Sweet Sixteen in 26 of the 28 tournaments; at least two #1 seeds has made the Sweet Sixteen every year. * #2 seeds: At least two #2 seeds have made the Sweet Sixteen every year since 2001. * #3 seeds: The only year that there was no #3 seed in the Sweet Sixteen was 1997. * #4 seeds: Three #4 seeds in the Sweet Sixteen this year is the most since 2000 when three #4 seeds made it to the round of 16. * #5 seeds: No #5 seed made the Sweet Sixteen this year breaking a streak of 19 straight tournaments that a #5 seed has been in the final 16. * #6 seeds: This is only the second year in the past five that a #6 seed has made it to the round of 16. * #7 seeds: #7 Florida this year is the first #7 in the Sweet Sixteen since 2008. * #8 seeds: Only two #8 seeds have made it to the Sweet Sixteen in the last 10 years. * #9 seeds: Only two #9 seeds have made it to the Sweet Sixteen in the last 18 years. * #10 seeds: Three #10 seeds made the final 16 in 1999. * #11 seeds: A #11 seed has made the Sweet Sixteen three straight years. * #12 seeds: At least one #12 seed has made the Sweet Sixteen in eight of the last 12 tournaments. * #13 seeds: #13 Ohio this year is the first #13 seed in the Sweet Sixteen since 2007.